Democratic Leader Nancy Pelosi kicked off Women’s History Month with her annual reception at Statuary Hall in the U.S. Capitol, honoring women veterans for their service, and SDI’s long time friend and client Brigadier General Wilma L. Vaught, U.S. Air Force, Retired, one of the most decorated military women in American history. SDI has been proud to work with General Vaught over the last 20 years to build, dedicate and support the Women’s Memorial. Built at the entrance to Arlington Cemetery, the Women’s Memorial is dedicated to the service of women in the military since the Revolutionary War through today. SDI Chairman Susan Davis and Executive Vice President Judy Whittlesey had the privilege of attending the exceptional Women’s History event, with special guests First Lady Michelle Obama and Dr. Jill Biden. 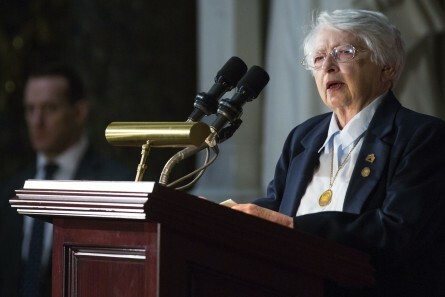 General Vaught’s remarks were a stunning reminder of the challenges and the barriers that women have faced in their quest to serve their country. Throughout the month on our Facebook and Twitter pages we’re paying tribute to women veterans and those currently serving who have played and continue to play an influential role in military history. These women broke barriers, made a difference, and by their words and examples became a source of inspiration, making it possible for other women to succeed. Susan Davis International is proud of its decades of experience working with the Defense Department and entire military community, nonprofit organizations that focus on military outreach, and corporations that offer support to the military market segment, and most especially proud of our work supporting the women who are and have served in defense of our freedom.